Honorary Doctorates of Fine Arts will be bestowed on Martha R. Rosler, a pioneering feminist and political artist from Brooklyn, New York, and Dr. Jock Murray, Professor Emeritus at Dalhousie University, during NSCAD’s Graduation and Commencement ceremony on Sunday, May 13. 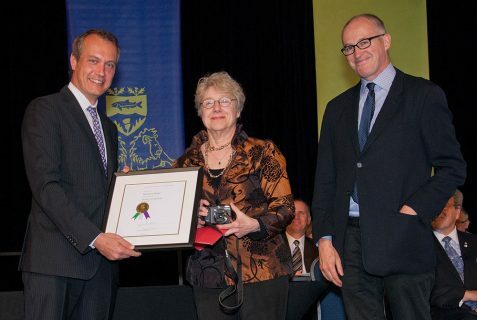 Dr. Martha Rosler (centre) with NSCAD President David B. Smith and Michael Donovan, Chair of the Board of Governors. 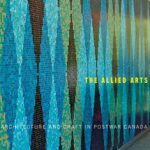 “I’m so pleased that these two prominent individuals from such different fields will be able to join us at graduation—always a colorful occasion at NSCAD—and look forward to having them address our Class of 2012,” says David B. Smith, President of NSCAD University. Since the 1960s, Martha R. Rosler has used photography, video, performance, and installation, as well as writing, to produce a penetrating body of work. She combines the feminist notion of consciousness-raising with rigorous conceptualism and a do-it-yourself aesthetic, while focusing on the ways everyday life and the public sphere intersect through the media, architecture, and the built environment. Through these investigations, she examines social issues, from war to housing and homelessness, often with an eye to women’s experience. 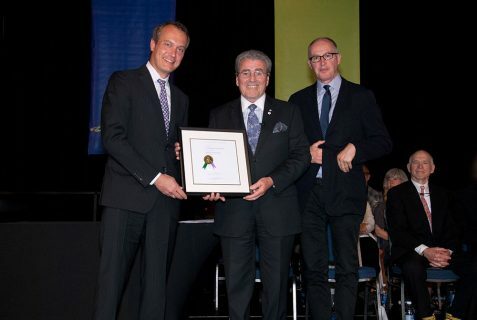 Dr. Jock Murray (centre) with NSCAD President David B. Smith and Michael Donovan, Chair of the Board of Governors. As a young man, Dr. Jock Murray was encouraged to pursue a career in art because of his drawing talent, but realized medicine was his true calling. He was the Chief of Medicine at Camp Hill Hospital, Head of Neurology, and served as Professor of Medicine, Professor of Medical Humanities, and Dean of Medicine at Dalhousie University. He is now Professor Emeritus. But he never forgot his love of art and what it can impart about the human condition. Dr. Murray particularly enjoys teaching medical principles using the art of Robert Pope, Frida Khalo, William Hogarth and lectures internationally on the history of medicine through 100 great works of art. He is particularly proud of founding the Medical Humanities program at Dalhousie as a way of achieving a balance between the sciences and humanities in medical education and of establishing the first artist-in-residence program in a medical school. He serves as the President of the Robert Pope Foundation which fosters and funds programs in the arts and humanities. More than 200 students will graduate with undergraduate and graduate degrees during the ceremony, which will be held Mother’s Day in the Cunard Centre. The Graduation Exhibition will be held May 12 to 20 at all of NSCAD’s galleries—the Anna Leonowens Gallery on the Granville campus; the Port Loggia Gallery at the Port Campus; and Seeds Gallery, 1099 Marginal Rd. 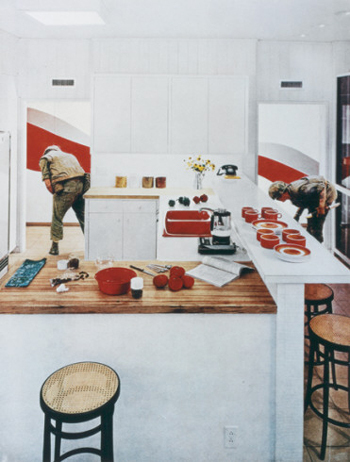 Red Stripe Kitchen by Martha R. Rosler (from the series Bringing the War Home: House Beautiful), 1967–72. 23 1/4 x 17 3/4 inches (59.1 x 45.1 cm). Solomon R. Guggenheim Museum, New York.